Bluegrass Pundit: Boko Haram uses 10 year old girl as suicide bomber? Boko Haram uses 10 year old girl as suicide bomber? There is no way to deal with these animals. but to kill them. If there is collateral damage, so be it. Also, any government that does not do everything it can to fight these terrorist, should receive the severest trade sanctions and zero U.S. taxpayer's dollars. 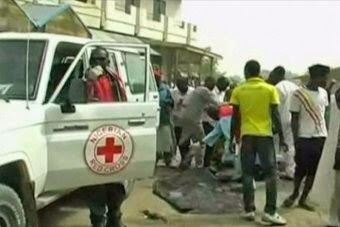 (Reuters) - A bomb strapped to a girl aged around 10 years old exploded in a busy market place in the Nigerian city of Maiduguri on Saturday, killing at least 16 people and injuring more than 20, security sources said.